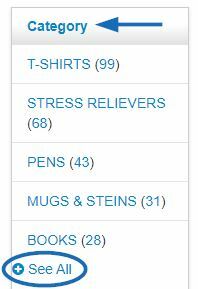 In the Manage Products tab, all products that have previously been entered into the database will be listed here. Use this tab to add, edit, deactivate or delete products. All active products will display on ESP and Distributor websites. When adding products, please review the ESP Data Standards. Enter the product number, product name or keyword in the search box at the top left of your screen and click the magnifying button. Use quotes in the search field to locate the exact product. You can also search for multiple products by separating them using a comma and a space. Filter your products by the criteria listed in the left hand column of the page: category, size, imprint methods, colors and more. The number in parenthesis is the amount of products which are categorized within the option. Click on the Sort by button and choose to sort your products by either the Last Updated Date, Product Name, Product Number, or Catalog so that they display in the order you prefer. If you need to add a product that is similar to an existing item, use the Copy button. From the Manage Products tab, locate the item that is most similar to the one you wish to add and then click on the Copy button. The Copy Product window will open and display the Product Name of the original item. 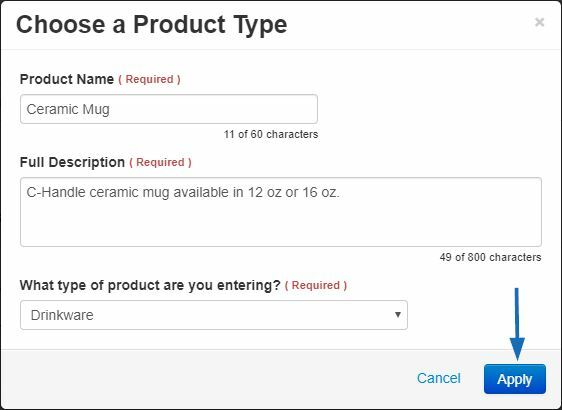 Enter a product name for the new product and then click on the Save button. The newly created product will automatically open in the editing area. Edit the product data accordingly. Copied products will be inactive by default, clicking on the Make Active button will add the item to ESP and Distributor Websites. The copied product will become its own product listing in the Manage Product tabs. Locate the item and then click on the Delete button. A confirmation window will appear with the message that deleting the product will permanently remove it from ESP and confirming that this is the correct action. Click on the "Yes, Delete this Product" button to complete the deletion. If a product is Inactive, it is still available in ESP Updates, but it is not available on ESP and Distributor Websites. The button in the product listing will show as "Make Active". The arrow enables you to select to make the product active now or set it to be active at a later date. If a product is Active, it is listed on ESP and Distributor Websites. The button in the product listing will show as "Make Inactive" and clicking it will make the item inactive. Distributors using ESP Web will see a special flag on all products that have been assigned to a special. In the example below, products that have a free shipping special are displayed with the Free Shipping flag on their product listing. After creating a special, you can use the "Add to Special" button to move a product to a special. The Bulk Edit button enables you to update multiple products at one time. Bulk edits can be made to all products, all filtered products, or selected products. Products must be filtered or selected before clicking on the Bulk Edit button. When the Bulk Edit Options window opens, select how to apply the bulk edit and then click on the field which will be updated. Then, click on the Bulk Edit button. Note: Scroll down in the Bulk Edit Options window to view the Imprint and Options fields. You will be able to edit the options for the selected field. Depending on which field you have selected, the editing options will vary. Make the needed changes and be sure to save them. In the Manage Products tab, you can add a new product by clicking on the Add a New Product button.